There is no magic secret as to how surfers glide through those spectacular water crests before they crash against the shorelines. They use carnauba wax. This wax is not only one of the original, but probably still the best product a surfer can use to protect fiberglass boards from weather damage and create a smooth barrier that repels water and reduces friction. So why not apply the same concept when detailing your car, boat, plane, or other vehicles? Polishing your fiberglass exterior preserves the shine and luster of a vehicle finish. It can also prevent and protect your surface from harmful weathering and usage effects. Use a quality product, like carnauba wax, for maximum protection. Try Garry's ROYAL SATIN for this exact kind of weather guard. Our cleaning based formulas include a layer of carnauba wax that provides superior protection and performance. Think all Wax is the same? Think Again! 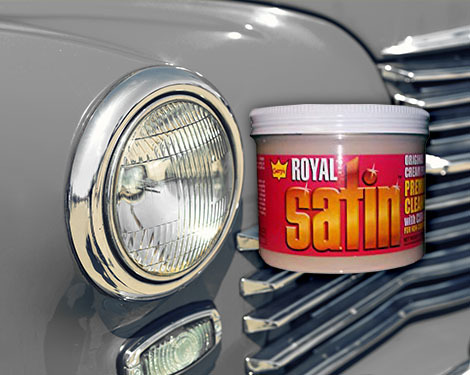 Garry's ROYAL SATIN has been the choice of professional detailers for years, and it's time you were let in on the secret. All of our wax items have dual band UV inhibitors to provide the longest lasting protection against the sun. Our one-step cleaner wax removes oxidation better than our competition, and its easy on-easy off formula will save you time and effort. Garry's ROYAL SATIN truly is one of the best performing one-step, light oxidation removers and polishers in its class, and all for much less than the popular name brands. Garry's ROYAL SATIN comes in more variations than most of the competition. We offer either liquid or our signature cream paste formulas, with sizes ranging from 10 oz. containers to 5-gallon pails for fleet use. You owe it to yourself to try this marine wax. You won't be disappointed!